Football: Twenty-two people running around kicking a ball for ninety minutes. ‘It’s just a game.’ ‘A bunch of overpaid sissies rolling around on the ground as if they’ve been shot.’ Irrespective of the truth in these statements, football is ubiquitous and undeniably popular. According to FIFA, 265 million of us play football. It also boasts a huge worldwide following: Premier League matches alone are officially broadcast in 212 territories. But what I find more interesting, though, is how it permeates so many people’s daily lives, including mine. I want to discuss how it determines our emotions, why we must unconditionally love some people but eternally despise others, and how it facilitates primitive yet innate notions, such as pride, and fosters a sense of belonging. How does a sport have such a grand impact on our lives? Firstly, football is an extremely accessible sport. All you need is a ball and a large, empty space – maybe the latter isn’t required. This means that the majority of us can participate. Furthermore, games are broadcast live, highlights are regularly shown, and updates are routinely included in the news with prominence. Generally, it can be exciting to watch as well. But that doesn’t explain the pious nature of many followers of ‘The Beautiful Game’. One big draw to following football is the sense of community. It helps form your identity; it’s like you belong there. It provides the platform for companionship with seemingly like-minded, well-spirited individuals. If a supporter of the club passes away, the community goes into mourning, for example. It also supplies camaraderie. There are, of course, downsides. Someone you have never met – a person, just like you – can be an enemy. I admit, singing about a rival team is inexplicably enjoyable at a game sometimes – but only because I can distinguish the rational part of my brain from the primitive emotions it is susceptible to. Much of this may be understood through psychology theories—for example, Social Identity Theory (SIT). SIT explains that self-image of the ‘in-group’ is enhanced by discriminating the ‘out-group’. Often this entails employing prejudices against ‘them’. You’ll experience this in other walks of life, e.g. through nationalism. At Premier League fixtures one set of fans will zealously sing about how they hate rival fans who they have never met. For example, Southampton fans will sing how Portsmouth fans live in mobile homes and call them ‘skate b******s’, while Portsmouth fans’ less-than-endearing name for Southampton fans is ‘scummers’. Clearly this serves the purpose of strengthening one’s own image at the cost of the outside group. By belittling a rival team and fans of that team, one can evoke a sense of pride in their own team and area, and promote a sense of self-worth and -image in the context of a group. Uniting against the same rival. There are other theories too. 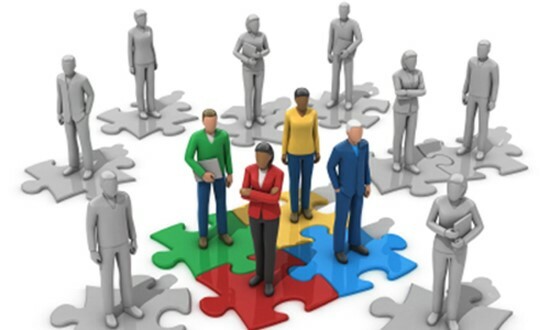 However, theories on crowd psychology are incomplete and vigorously debated since they cannot, for instance, explain group aspects such as prosocial behaviours. Nonetheless, there is credence in many of these theories, in my opinion. Sigmund Freud thought that, by being in a crowd, one exposes the unconscious mind, surmounting one’s ego. Gustave Le Bon describes how individuals in a crowd lose personal responsibility through anonymity, unquestioningly follow others, and draw emotions from a shared racial conscious, thus unlocking the archaic and uncivilised brain. It is therefore easy to see how a crowd environment at a game of football is conducive to irrational behaviour: this behaviour enhances one’s pride and emancipates one from day-to-day life. For me personally football has always been a constant source of enjoyment and an outlet for my competitive nature. Delving a little deeper, it is indeed a form of escapism for me. No matter what is going on in my life or how bad my week has been, I can apply myself in a completely unfettered way and forget about it. I lose my inhibitions. A small victory can seem huge. Anyone can experience this: in the Premier League and on Sunday mornings. 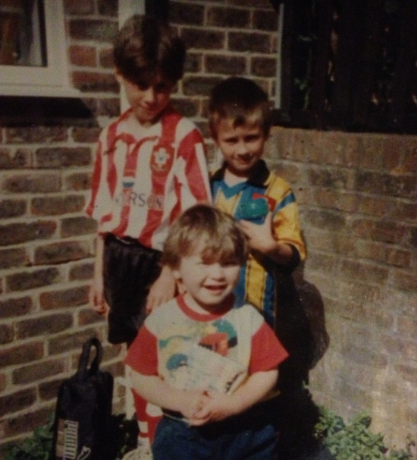 My brothers and I before we headed to Junior Saints training in the mid-Nineties. Like many, though, I am susceptible to becoming a victim of my underlying moods: emotions can overcome me. I do find it validating that this is a fault of many others too. Look at professionals such as Joey Barton and Luis Suarez (pictured) and observe that they play on the edge – which, most of the time, is a strength. But by doing that they can uncover what is lying below; expose something profound and ugly. 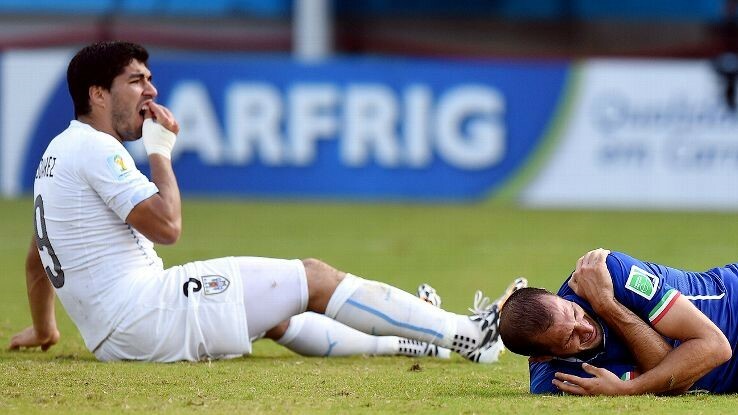 Luis Suarez has bitten fellow footballers on three separate occasions. ‘When time is at a premium for most people, leisure activity and entertainment fulfils the psychological need to escape from the stresses and strains of life and go into another world for a period of time. 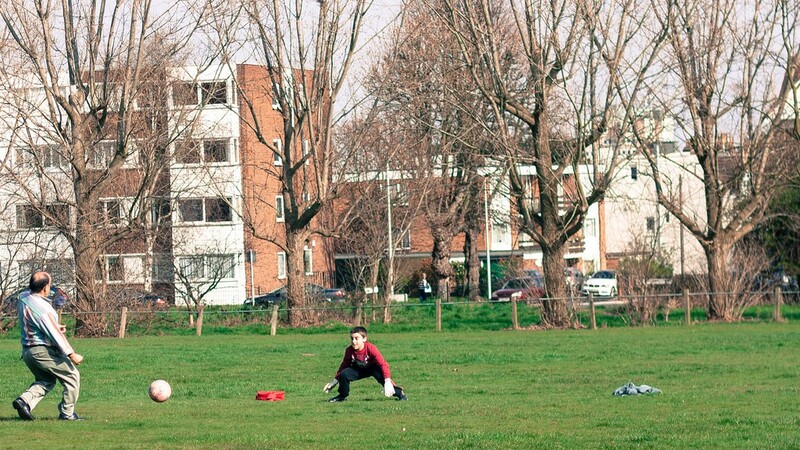 The time set aside for football is often sacrosanct and provides an opportunity to play. Even though fans proudly and willingly participate in songs, experience pure elation when the team scores, and share exaggerated sentiments, I’ve always felt that part of committing yourself to the team requires you to condition yourself and conform to the way of your club and the way of football. I’ve always loved football, but I used to prefer watching the game itself and subsequently analysing it, as my dad will attest. To sing songs in a group about a common, unknown enemy, to sing when I hate singing, felt like a form of unnatural yet natural initiation. I do love it, of course. But there are aspects to football which I despise. This includes hooliganism; the conflation of political expression and football, whether that’s the abuse of players who do not align with nationalist sentiments or Nicolas Anelka’s quenelle gesture; the racist abuse of players by fans and players; and even murder. McClean does not want to bear the poppy on his shirt. He is also opposed to singing the national anthem. He has been abused for both. With regard to supporting my team, though I cognitively understand that I haven’t actually achieved anything when I watch ‘my’ team play and boast when ‘we’ win, I still feel that irrational sense of pride. In a way, following a football team exhibits similarities to following a religion: dedication is unconditional, there is a significant community spirit, regular people are idolised, there is unity, and logic can somehow be irrational. Arguably football has parallels to revering a figurehead such as a monarch or seeing your favourite band in concert. But increasingly our support is becoming a number: a financial number. 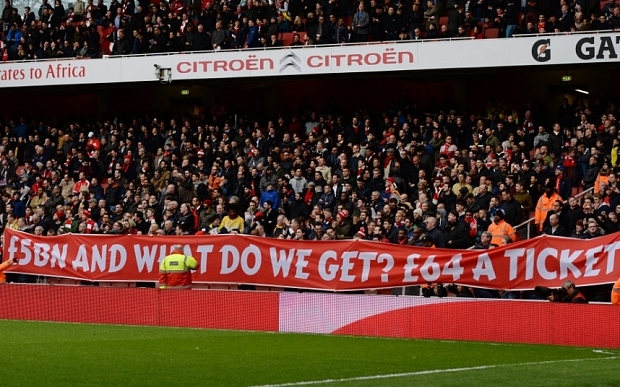 Ticket prices are expensive and Premier League television rights are valued above £5 billion (that’s over £10 million per game). Given everything that has been said, it is hardly surprising that many people indeed pursue that sense of belonging and local pride – especially if one considers how community spirit is dwindling in society. The game is being globalised. Clubs are business entities. Fans are being priced out of an emotionally appealing and extremely accessible sport. Yet we are still addicted. To be honest, I’m sure many other activities could enthuse the nation, as there is a capacity for pride and validation in humans to be engaged through a community. By evoking these primitive feelings, a positive purpose is served for many. I just wish that silly humans could recognise the primate inside of them and distinguish that from community spirit for a few hours on a Saturday afternoon.